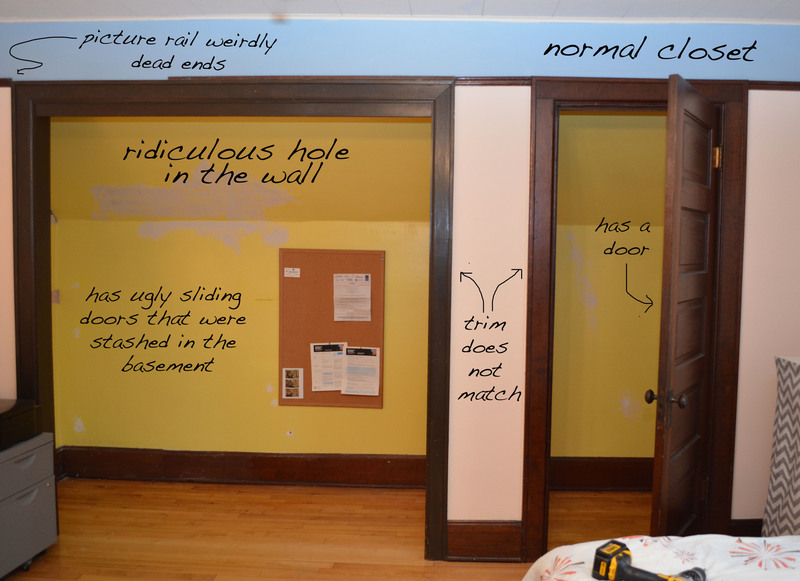 On the right, you can see a normal closet. On the left, you can see what amounts to a ridiculous hole in the wall. I’ve taken the liberty of pointing out everything I hate about this weird configuration in the photo above. But wait, it gets weirder. They’re connected. That’s right. It’s one giant closet with two entrances. I think the closet was originally very, very deep. 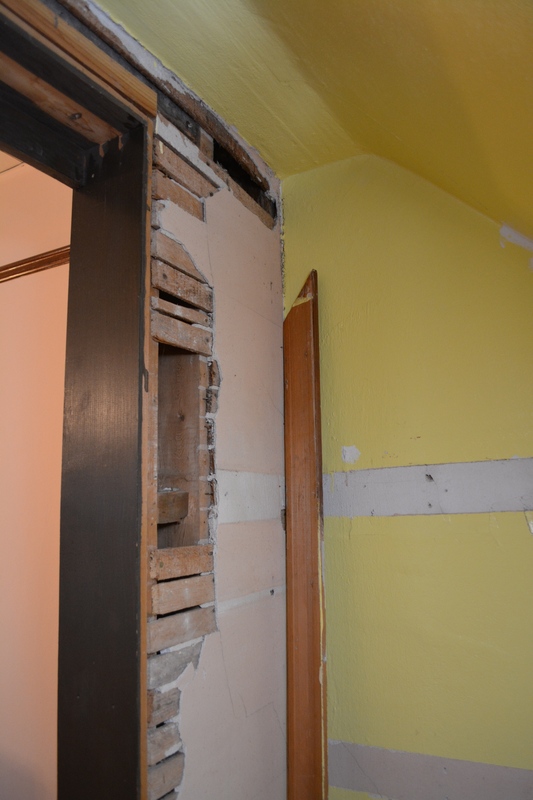 But a previous owner got frustrated and took a Sawzall to the wall to create that extra-wide opening on the right. That’s my theory anyway. Sure, that opening gives you access to the depths of the closet. But it’s ugly. It pisses me off that they didn’t even try to match the existing trim when they framed it out. And the inside is a total nightmare. When they cut the hole, they severely damaged the plaster on the inside of the closet. And then rather than fixing it, they covered the damage with trim and cheap pieces of paneling. I’ve pulled all of that off so that I can practice my wall patching skills and fix the damage properly. Hello, plaster buttons and joint compound. Let’s be best friends. 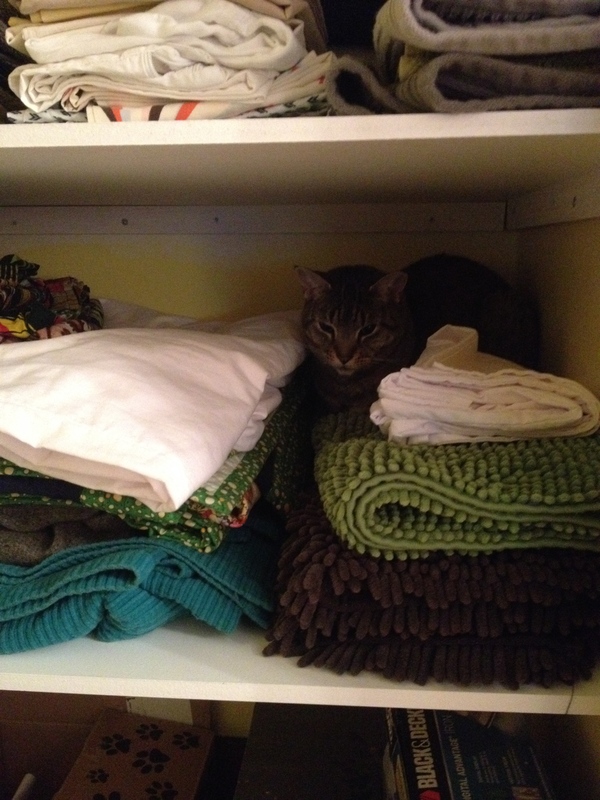 The linen shelves in the normal half of the closet are a new addition. Soren had a hell of a time getting them to fit. The walls are not straight, so each shelf had to be painstakingly trimmed. I left just enough room underneath for an Ikea drawer unit. But we could do rolling bins instead. The little princess has already taken up residence. What is it about cats and piles of clean laundry? 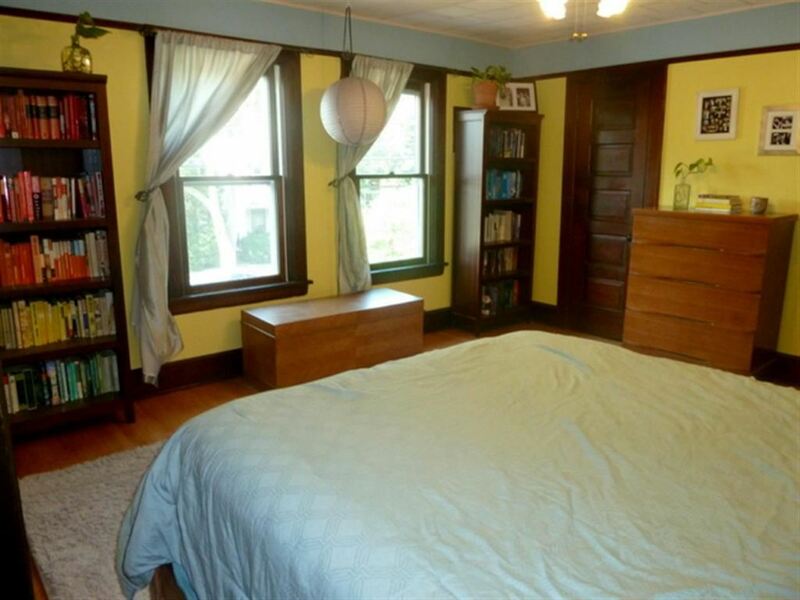 The previous owners used this room as their bedroom, and they put their bed in front of the nook, an arrangement that I find totally awkward and awful. 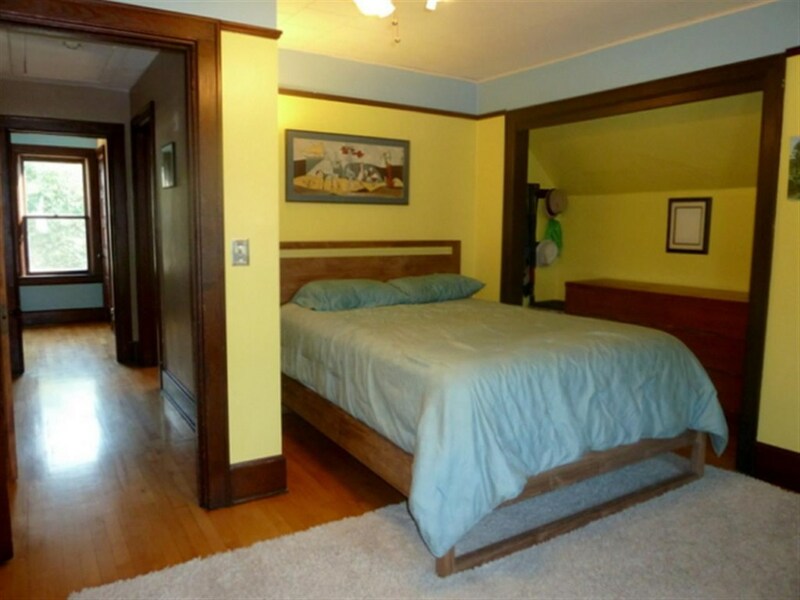 This is the largest room, but I much prefer having the bedroom in the middle bedroom, a space that’s rectangular and cozy. A space that allows us to each have a nightstand. Did I mention there are three closets? The third one is in the other corner of the room. Here is what that corner looked like before we bought the house. This room serves double duty as my office and the guest room, but rather than shoving the bed in front of the nook, we put it in front of the windows. I’d like to put my office in the nook instead. 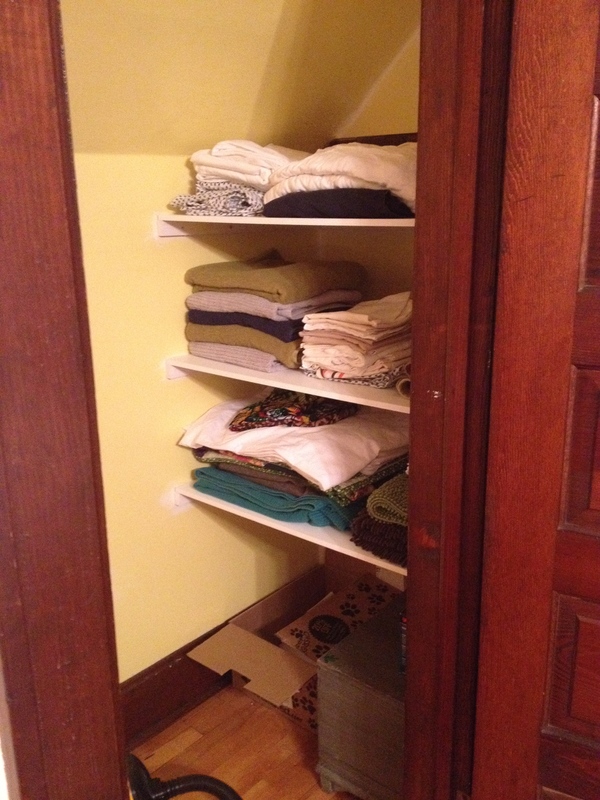 So here’s my vision: Put a wall between the two halves of the closet. 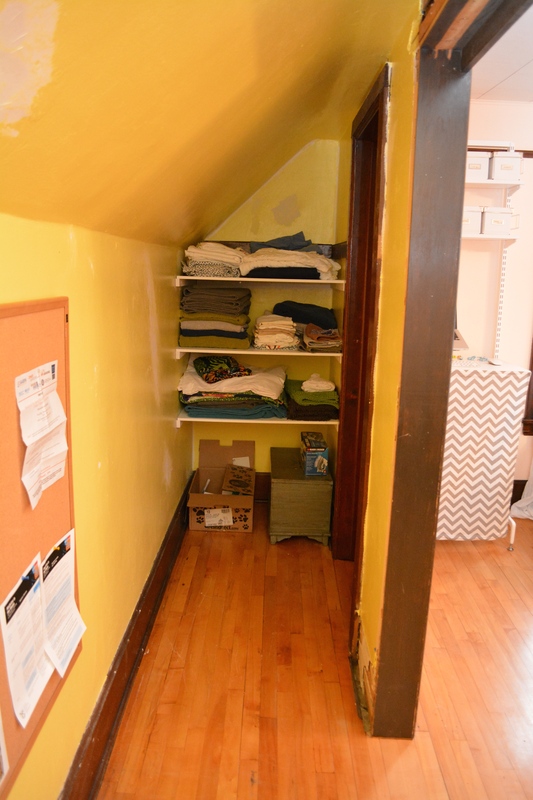 The far left side will have built-in shelves (similar to the ones that Daniel built) with an outlet underneath. (See terrible mockup below). The right side will hold my desk. 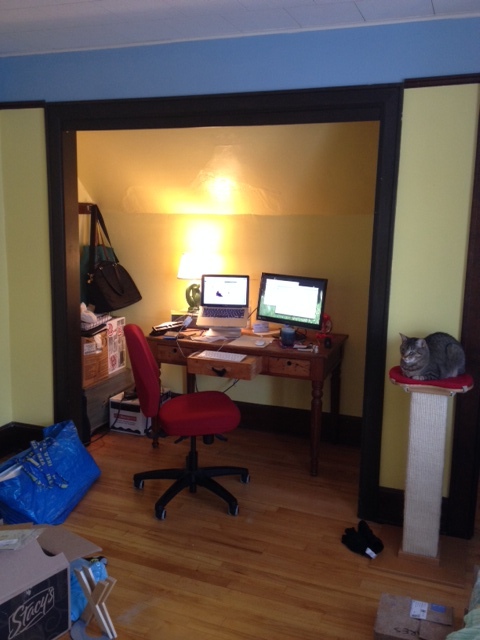 Here is what it looked like when I had my desk in the nook, before I started tearing things apart. Don’t judge. We had just moved in when this photo was taken. This is just to give you a sense. And I don’t plan on using that particular desk. Typing on an upside down drawer is not ideal. I’d like to either create a desk that’s built in. Or perhaps just make a new one that’s really simple — just a flat top and some legs. – should the desk be one really gigantic shelf that extends the entire width of the nook (but not as deep)? 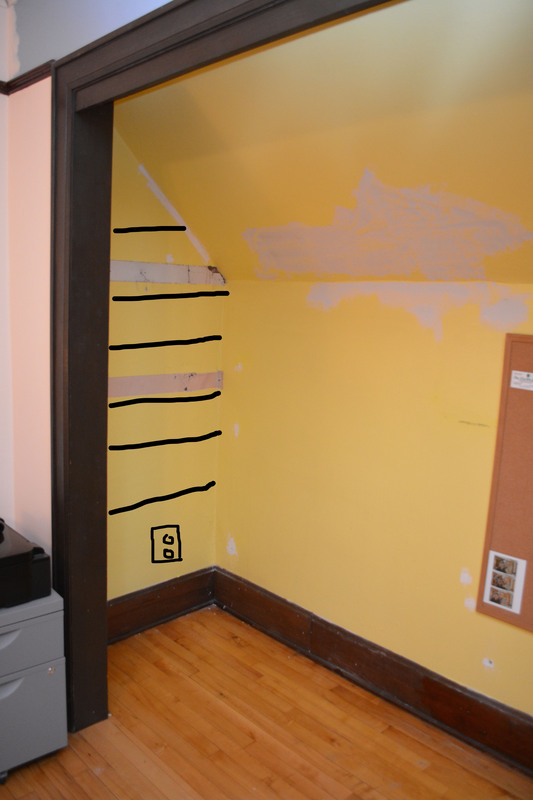 – should I wallpaper the back wall of the nook, or paint it some color other than the peach that is on the walls? – what color should the shelves be? white? light wood? stained to match the trim? – should I bother trying to do anything to the trim to make it blend better with the existing trim? – should I put a length of quarter round on top of the nook trim so that the picture rail doesn’t dead end into thin air? – built in desk or removable?